The Railway Terminus Hotel at the right, c. 1871. From Manukau Progress, 1960. Onehunga local historian GGM Mitchell, in a series of articles in the Manukau Progress, dated the hotels on the site at the corner of Princes and Queen Streets back to April 1865, when John Samuel Williams fronted up to the local licensing committee with plans and specifications for a building he was still constructing (since November 1864). The committee approved the license for the hotel, dubbed the Courthouse Hotel (it being so called, Mitchell said, as it was right next to the Onehunga Courthouse) and said Williams was allowed to sell beer once he had erected the bar. The hotel became a centre for meetings of great importance to the future of Onehunga. 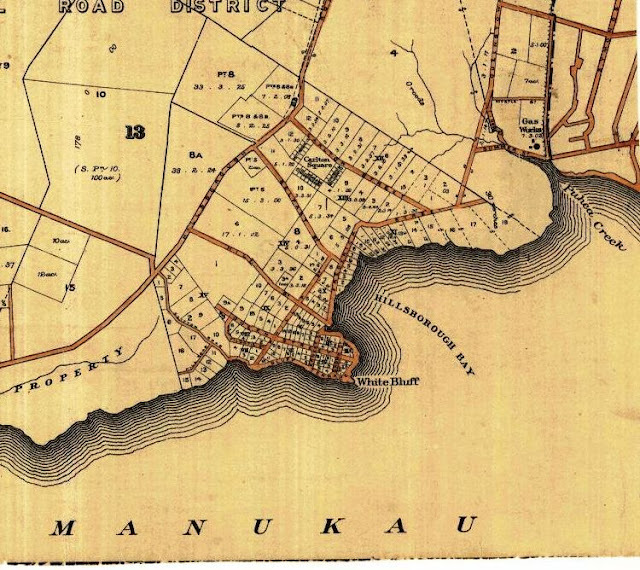 In 1866, the Mangere Bridge Company formed there, aiming to impress upon the government the importance of a harbour crossing linking Onehunga with her southern neighbour. By July 1867, the next publican was H Powning Stark, Auckland Provincial politician and land speculator. His time there was brief. Fire ended the Courthouse Hotel on 12 June 1868. Stark passed the hotel over to another political figure, John Lundon, who started building the replacement from the end of 1870. 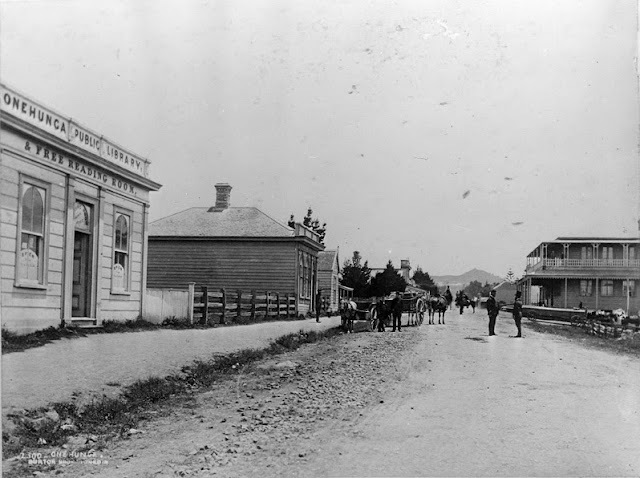 The licensing application for the Railway Terminus Hotel was approved 21 June 1871, in nice time for the completion of the Auckland to Onehunga rail line in 1873. So, in the course of researching this post, I found something I had no idea of before: that there was proposed, in the early 1870s, for White Bluff at Hillsborough to become the railway terminus instead of Onehunga. “The use of this name [Railway Terminus Hotel] is part of the story of the internecine struggle which involved two strong groups of businessmen in Onehunga. One group sought to grasp the opportunity to secure in their own hands the increase in trade that they anticipated would result from the linking of Onehunga with Auckland by a railway line. The opposing group had secretly resolved to urge the government to extend the railway line to White Bluff where there was, they contended, sufficient depth of water to enable steamers and fair-sized sailing craft to lie close in to the shore. 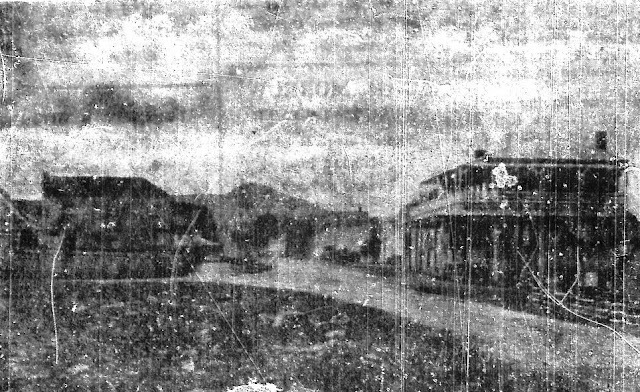 Plans had been prepared by an Auckland marine engineer for a wharf at White Bluff which would render the existing wharf at the foot of Queen Street [Onehunga] no longer necessary. The railway line to the new wharf site would be carried through a tunnel under Queen Street, down Princes Street, then across a stone causeway from the Beach to Hillsborough, and thence along the foreshore to White Bluff. “Mr J C Hill, who owned the land through which the line would pass, had had street and building sites surveyed in the confident belief that the government would sanction the plans of the promoters. The latter, meantime, were being subjected to the bitter and loud-voiced castigations of their fellow-citizens for their unpatriotic machinations. For long years after, the “Kelly Gang,” as the promoters of the scheme to render nugatory the wharf at the end of Queen Street were execrated by the group which manfully supported the government’s proposal to make Onehunga the terminus of the railway line from Auckland. Actively engaged in the work of defeating the aims of the “Kelly Gang” – three well-to-do members of which were engaged in 1872 in building a fine new hotel building at the corner of Captain and Selwyn Streets – was Mr John Lundon. He was ale, by virtue of his standing with the government, to thwart the aims and objects of the “Kelly Gang”. This group was busily engaged in putting pressure on the government to establish the Onehunga Railway Station in Selwyn Street, close to their hotel, which was to be called the Railway. But John Lundon spiked the guns of his opponents by securing the approval of the Licensing Committee to the name Railway Terminus being conferred on his hotel. White Bluff was an anchorage and cattle landing place by the early 1860s, timber was loaded there, and it was an embarkation point for troops heading for the Waikato during the land wars that decade. Extending the planned Auckland to Onehunga railway line to White Bluff was something the Provincial Council treated seriously in 1867. Even after the spat which Mitchell described in his articles had taken place, White Bluff loomed over Onehunga’s aspirations to being the dominant port on the Manukau Harbour into the early 1880s, with Sir George Maurice O’Rorke pledging to his Onehunga constituents that he would prevent White Bluff dominating if a Harbour Board was set up for the Manukau. But after that, it was all over. 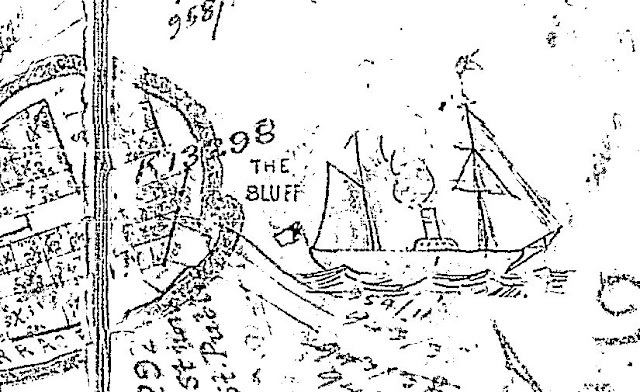 Onehunga was dominant, and White Bluff became just another yachties’ landmark, like Cape Horn. But all this does help explain more about why Hillsborough was such an early subdivision, as well as perhaps a reason why Cape Horn was considered as an 1880s defence post, and that there was no harbour board for the harbour until 1911. Looking north up Queen Street 1890s, the Railway Terminus Hotel on the right. Note the Onehunga Public Library on the left, replaced early in the 20th century by the Carnegie Library building close by. Ref. 4-846, Sir George Grey Special Collections, Auckland Library. 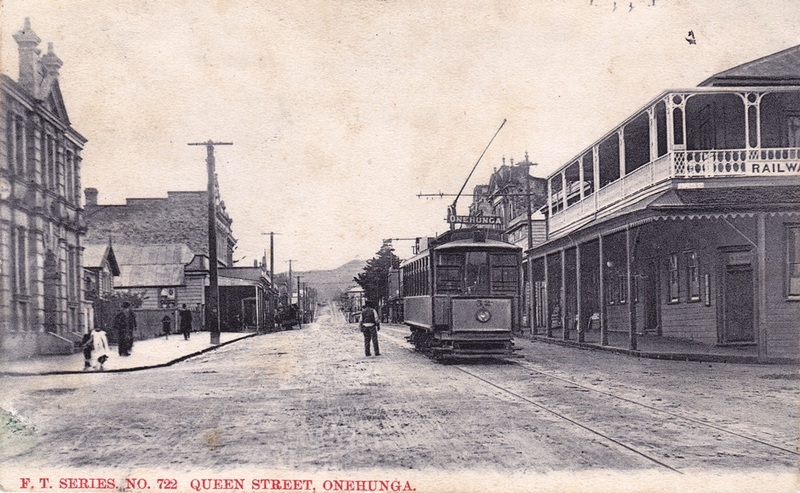 A postcard recently acquired which sparked off this blog post: Looking up Queen Street Onehunga c.1906. Onehunga Post Office at left, the Railway Terminus Hotel at right. Back to Onehunga’s new Railway Terminus Hotel which, despite the victory for Lundon and Co, wasn’t doing all that well as far as business went. James Sullivan took over in 1873, a man said by Mitchell to have “a wide knowledge of classical literature and of the latest scientific theories and political systems.” He knew both Latin and ancient Greek languages. He was a chief supporter of George Maurice O’Rorke, and is said to have helped the latter into the House of Representatives. In 1893, Sullivan ably assisted another famous Onehunga identity into politics, Elizabeth Yates, after Sullivan himself had retired in 1887. A Schultz was a licensee, then M Edgar (1890-1893), Patrick Benison and W H Knock in 1893, W J Bray in 1894, then B C Roberts 1896-1899. Mitchell provided a list of many subsequent licensees. Around 1925, the name of the hotel changed to that of the Post Office Hotel. It was purchased by the Onehunga Borough Council in around June 1971, and demolished within a year. "Hi there, have been enjoying reading your blog. An Onehunga building I have sometimes walked past, and wondered about its history, is at 19 Princes St, Onehunga. It seems to have a modern facade but is built in stone and looks pretty old. I wondered if you'd done any research on it." I have some info on the stone store at 19 Princes Street, yes. It's associated with James Ninnis (d.1879) who arrived in Auckland in 1846, worked as a manager on Kawau Island as manager of one of the mines there, and bought the Onehunga site in mid 1852. He was involved with a number of businesses at Onehunga, including carting lime to Auckland, but by the 1860s he left Onehunga behind for flax-milling enterprises in South Auckland. In my notes, it says that most of the stone is covered today by modern materials. Bit of a shame, that. "Hi, thanks for that, its older than i thought. Maybe someone will give it a nice restoration one day. Although its surrounded by modern industrial buildings now, and i guess the currently empty block next to it will be more of the same. Cheers"
Cool blog post. That's my great-great grandfather standing in the middle of what is now Onehunga Mall, Sergeant Bernard Greene of the NZ Police.